Salicylic acid is a colorless, crystalline substance and has pain relieving and anti-inflammatory properties. Majority of the salicylic acid produced is used as a key ingredient in the manufacture of aspirin. In addition, salicylic acid helps in curing various skin ailments including blemishes, acne, psoriasis and dandruff among others. Preservatives in food, intermediate in the manufacture of chemicals and fragrances are other uses of salicylic acid. Growth of the global skincare and haircare market is expected to drive the demand for salicylic acid, as more and more consumers are becoming increasingly aware of benefits of salicylic acid for skin and hair. In addition, growing demand for aspirin on account of its medicinal benefits on health coupled with increasing awareness regarding general well-being among consumers is expected to augment the demand for salicylic acid over the next few years. However, growing concerns regarding the side-effects of exposure to salicylic acid through excessive consumption or excessive external application such as blistering of skin, intoxication and irritation of stomach lining is expected to hamper the growth of the market. Research studies proving the reduced risks of dementia, strokes and Hughes Syndrome among patients is expected to open new opportunities for the growth of the market in the next few years. Pharmaceuticals was the largest application segment present within the salicylic acid market and accounted for over 50% of the total demand in 2012 as salicylic acid has been primarily used as a key ingredient in the manufacture of aspirin and as an additive in various other drugs and ointments. The growth of the global pharmaceutical market on account of initiatives by various national governments coupled with rising awareness regarding general well-being among consumers is expected to fuel the demand for salicylic acid over the next few years. However, skincare is expected to witness the fastest growth within the salicylic acid market over the next few years closely followed by haircare. 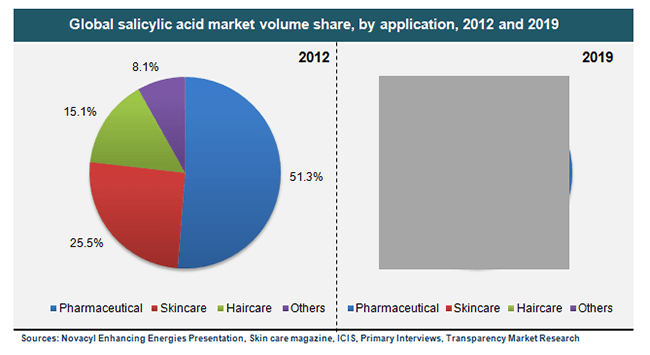 Demand for salicylic acid was highest in North America followed by Europe in 2012, together accounting for over 60% of the market. Prevalence of a large skincare and haircare in this regions resulted in a high demand for salicylic acid. In addition, presence of a large pharmaceutical industry led to an elevated demand for salicylic acid. Asia Pacific is expected to witness the fastest growth in terms of demand for salicylic acid within the forecast period due to the growing pharmaceutical, skincare and haircare market. Changing lifestyles and growing awareness regarding healthy skin and hair among consumers present in Asia Pacific, is expected to drive the skincare and haircare market. Furthermore, increasing consumer awareness regarding the benefits of salicylic acid on skin and hair is expected to augment its demand in skincare and haircare products. Moreover, growth of the pharmaceutical market due to growing ageing population, government initiatives and rising awareness regarding general well-being among consumers is expected to fuel the demand for salicylic acid, as it forms a vital ingredient of several drugs and ointments. The global salicylic acid market has received a tremendous boost from the escalating demand for skin and hair care products as consumers have become increasingly aware about the benefits of salicylic acid. Salicylic acid, a colorless crystalline substance, has been known to possess anti-inflammatory and pain-relieving properties and is largely well-known as an ingredient in the manufacturing of aspirin. While its benefits in the pharmaceutical industry for the healing of various skin ailments is common knowledge, salicylic acid also finds application in numerous other sectors such as hair care, skincare, chemicals, food, and fragrances. The market study - with the help of primary and secondary resources, interviews, and inputs from industry experts - provides a deeper understanding of the working of the salicylic acid market by exploring the different factors that drive as well as hamper the growth of the global market. The salicylic acid market, according to the research report, is estimated to reach a value of US$521.2 million by 2019, growing from US$292.5 million in 2012. If these values hold true, the global salicylic acid market is poised to register a healthy CAGR of 8.6% from 2013 to 2019. The key forces that have contributed to this growth of the salicylic acid market include rising demand for aspirin, increasing awareness among consumers regarding general well-being, surging demand for skincare and hair care products, and ongoing research activities affirming the role of aspirin in reducing the risk of strokes, dementia, and Hughes Syndrome in patients. However, excessive consumption or external application of salicylic acid can result in side effects such as intoxication, blistering of the skin, and irritation of the skin lining. Concerns associated with these side effects are estimated to restrict the growth of the global salicylic acid market. Pharmaceuticals formed the largest application segment in 2012 with a share of more than 50% of the total demand for salicylic acid. Geographically, North America dominated the global market with a 35% share in 2012, followed by Europe. Presence of a strong pharmaceutical industry and increased demand from the skincare and hair care segments has boosted these two regional markets. Asia Pacific has been identified as the fastest developing region by 2019 owing to increasing consumer awareness, change in lifestyle, government initiatives, and growing ageing population. The prominent vendors operating in the salicylic acid market include Simco Chemicals Inc., J.M. Loveridge Limited, Zhenjiang Gaopeng Pharmaceutical Co. Ltd., Novacap, Alta Laboratories Limited, Alfa Aesar, and Siddharth Carbochem Products Ltd. These companies are profiled in the salicylic acid market research report on the basis of attributes such as company and financial overview, product portfolio, business strategy, strengths, weaknesses, opportunities, and threats.